Soon thereafter you shall be alertisized. Now, to the point. We had a number of responses to this pine photographed at Cacopon State Park in Maryland enroute to the International Society of Arboriculture Conference in Washington D.C. Responses ranged from red pine (2-needled instead of 3-needled), to ponderosa pine and Jeffrey pine (not common in eastern forests), to more southern pines such as Virginia pine, pitch pine, and shortleaf pine (Pinus echinata), which does still seem somewhat a possibility to me. The answer, though, as verified to the best of my ability thusfar, by checks of keys and the collective wisdom of arborists at the ISA Conference is…loblolly pine (Pinus taeda). Say what? Three needles, longitudinal plates of bark, green seed cones that become brown and squat with age, great height at maturity – some of the features. And, unlike here in Ohio, where it is not known in common parlance, it is an extremely common southeast U.S. forest and timber tree. In fact, U.S. Forest Service surveys show it to be the second most common tree species in the country – after red maple. It is also the most important timber tree in the southeastern U.S.
Not everyone is a fan. President Eisenhower, despite masterful swings, kept finding a loblolly pine in the way of his golf balls on the 17th hole of Augusta National Golf Club. He wanted it removed, only to be rebuffed by loblolly-loving local rules and had to settle for it being forever named the Eisenhower Pine. Check out augustaga.gov for good images of the young and old cones. 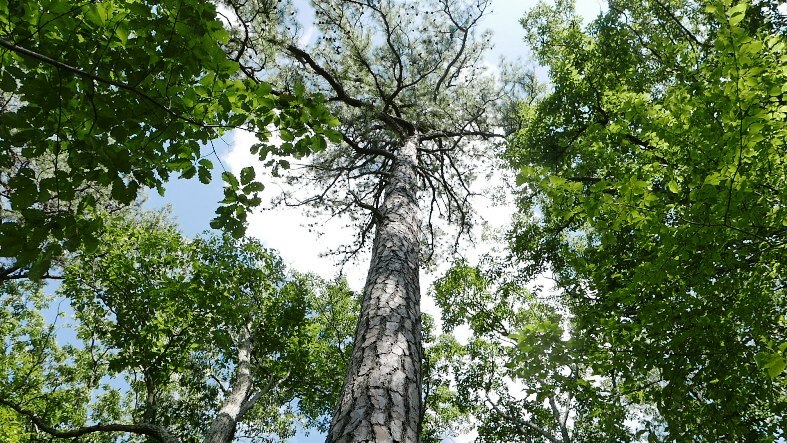 And check out the National Champion loblolly pine, 169 feet high, at the Congaree National Park. I admit that this is a park I have never visited before, but now plan a visit in the next few years to the Hopkins, SC area. Oh, yes, the winner of the quiz, the first to identify it as loblolly pine (Pinus taeda): Heather Augustine, Associate Professor in the Landscape Horticulture Department at Cincinnati State Technical & Community College. Next time I visit Cincinnati, I shall deliver some blackberry jam from Shenandoah National Park. Mary Jo Vesper and Nick Deemer also got it right, but Heather was the first.